Groups are specialized audience fields that let contacts self-categorize based on interests or preferences using uniform responses you set. Groups can be used for any data you want to collect about a contact, like favorite foods, preferred store locations, or anything else you want to know. In this article, you'll learn two ways to create groups in your audience. Groups work best if you need contacts to self-categorize when they subscribe to your email marketing. For internal audience organization, consider using tags. Group fields can be required on pop-up signup forms, and the Signup Form content block on landing pages, but not on hosted or embedded signup forms. 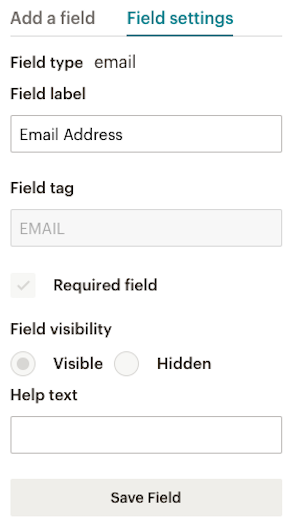 Advanced, paid users can use the Advanced Forms option to custom-code a required group field. Group fields appear at the bottom of your audience's signup form, because they work different than regular audience fields. Each audience can have up to 60 group names. Group categories don't count toward the 60-group limit. You can also use group data to target contacts who are in a specific group or who are not currently in any group. To create a group from the Groups page, follow these steps. Click Create Groups to expand the group options. 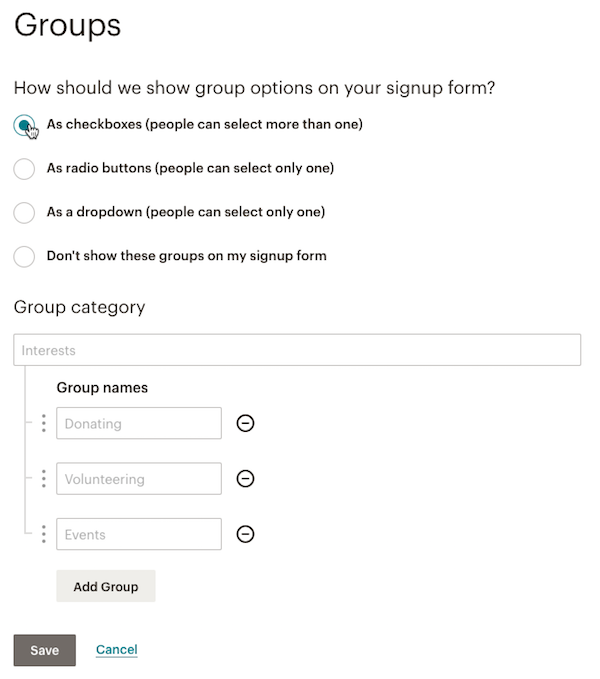 Choose an option for how the groups will appear on your signup form. Type in a Group category and at least one Group name. The Group category is the overall category or theme for your groups, and is visible to subscribers. Create something descriptive, like, "favorite food" and use the Group names to display different options. To add more Group names, click Add Group. A success message will display with the option to Import To These Groups, or click Done For Now. To create a group in your signup form, follow these steps. Confirm you're on the Build it tab. Select the type of group you want — Radio Buttons, Check Boxes, or Drop Down — from the field types on the Add a field menu. Click Field settings to set your preferences. Click Add An Option to add as many options as you need. 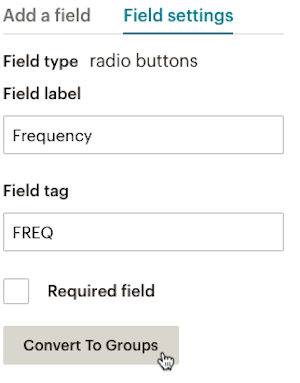 When you add a Radio Buttons or Drop Down field to a form, it's a regular field by default. To convert the field to a group, click Convert to Groups on the Field settings tab. Use Mailchimp's groups to organize subscribers based on their interests and preferences.